Each year, the Gulf of Maine Council gives out Visionary and Longard Awards recognizing innovation, creativity and commitment to protecting the marine environment of the Gulf of Maine. The Visionary Awards are presented to two individuals, businesses or organizations within each state and province bordering the Gulf of Maine. One Longard Award is presented to an unpaid individual from one of the five states and provinces who is dedicated to environmental protection and sustainability of natural resources within the marine, near shore and watershed environments of the Gulf of Maine (see story on Roger Berle, Pages 1,8). The award is named in memory of Art Longard, a founding member of the Gulf of Maine Council. Growing up in the shadow of the six-million-acre (2.4-million-hectare) Adirondack Park in New York State, Susan Jones Moses was never far from open spaces and natural water  the type of environment she now works so hard to protect in Essex County. When she first moved to the North Shore of Massachusetts in 1992, she said she was struck by the pace of development. In her own town of Rowley, which sits on the edge of Great Marsh, agricultural land was rapidly disappearing to new housing. Jones Moses went to work. 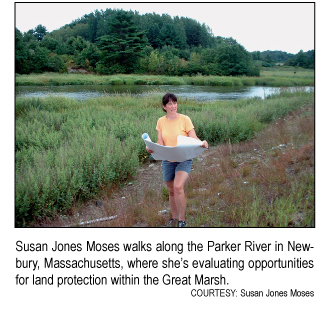 Combining her expertise as a planning consultant with her flair for distilling complex issues into terms people could understand, she built local support for town overrides and laws that now protect more than 400 acres (162 hectares) of the marshs watershed. Her educational push also comes in the form of workshops on smart growth issues for local planning and zoning boards. She argues for open space protection to be an integral part of affordable-housing design. At the most fundamental level, she challenges people to think outside their own interests. Ed Becker reckons there are two decades left to make a difference. 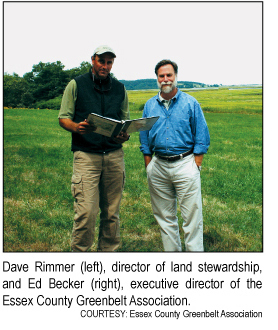 The executive director of the Essex County Greenbelt Association is referring to the nonprofits conservation efforts. Over the years the land trust, based on the North Shore of Massachusetts, has steadily acquired parcels of land that have ecological, scenic or agricultural value. But as prices soar and development encroaches, the opportunity to protect is diminishing. We know that 25 percent of the land base left is available for development, Becker said. But not all of that is worth conserving. As the window closes, Greenbelt is becoming more strategic and proactive in reaching out to landowners,Becker said. In 46 years, the association has protected more than 12,000 acres (4,856 hectares) of land and transformed 4,500 acres (1,821 hectares) of that into a reservation system open to the public. Some of those parcels skirt Great Marsh and offer unique opportunities to bird watch, hike and canoe. Walks, talks and a guidebook are all part of the organizations educational output along with information on the natural history of all the reservations. As its name suggests, Greenbelt is keen to create natural corridors along rivers, streams and coastlines both for the view and the environmental benefit. Past successes and a reputation for getting things done have aided that quest, Becker said. The organization is often approached by owners wishing to gift their property or create a conservation easement. Increasingly, he said, Greenbelt is using that real estate experience to assist cities and towns in Essex County to protect more open space and compound the conservation effort. Each day salt water comes rushing up the Piscataqua River in a 10-mile (16-kilometer) race to meet fresh water in New Hampshires Great Bay. That mingling of sea and river in the countrys most recessed estuary has created a unique ecosystem, one that the Great Bay Stewards are working to protect. The Great Bay National Estuarine Research Reserve was established in 1989, and five years later a Discovery Center was built at Sandy Point on the bay. The Stewards came along in 1995 to support the reserve and the center, monitor the watershed and organize fund-raising and educational events for children and adults. Each year, the Stewards offer two University of New Hampshire students $1,000 each to do a research project on the bay. One project last year measured the nitrogen levels around the bay and thus the pollution, said Peter Flynn, the president of the Stewards. If you want to capture childrens attention, introduce them to a 60-foot (18-meter) inflatable fin whale. Thats the approach of Jen Kennedy and Dianna Schulte, who use the home-made mammal in school presentations on the marine environment. 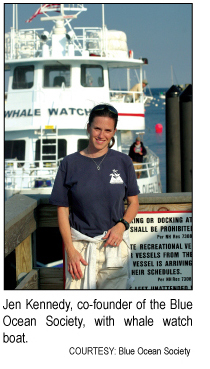 The two whale-watch naturalists and cofounders of The Blue Ocean Society for Marine Conservation work hard to engage children and the public. To that end, the Portsmouth, New Hampshire, nonprofit coordinates with four local whale watch companies and offers presentations to waiting passengers. Since people learn in different ways, Kennedy said, the naturalists try to address all the senses  through whale sounds, reading materials, touch tanks and talks. The touch tanks, an idea Kennedy developed with the help of interns, sits dockside full of small sea creatures people can meet up close. But perhaps not too close since they include crabs, sea urchins and sea stars. Education is only half the story. 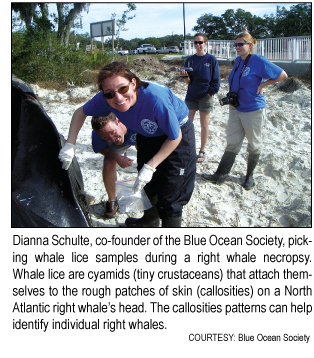 Blue Ocean collects data on marine life from the whale boats and tracks floating debris. Whale fins are photographed and a detailed record of each mammals behavior noted and catalogued. All this data is then shared with other whale research organizations in Maine and Massachusetts and made available to the public. It even becomes the basis for science projects in schools. Blue Oceans research on endangered species also helps conservation efforts and is used to identify areas that need protection. Regular beach cleanups and an Adopt-a-Beach program begun in 2004 have become successes, with 25 adoptions so far. Jane Disney claims no credit. She said her students took her places she didnt have the courage to go. The Mount Desert Island Water Quality Coalition (MDIWQC) grew out of their initiative, the former biology teacher said. And in the space of a few years, since its inception in 2000, the coalition has lived up to its name. By drawing together children, college students, island residents, businesses and fishermen into its projects, it has built community awareness of the local watershed and fundamentally changed peoples behavior. It all started at Seal Harbor Beach. There, the students monitored water quality to identify pollution issues that threatened public health. 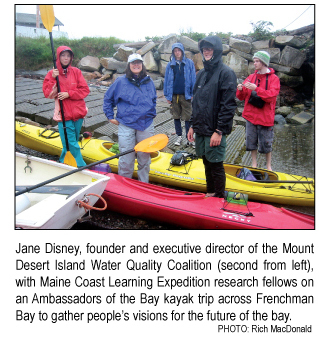 From that the coalition gathered momentum and now includes regular surveys of clam flats and the shoreline; plankton and beach monitoring; research and education at its bio lab and the Community Environmental Health Laboratory, which runs in partnership with the MDI Biological Laboratory in Salisbury Cove (Bar Harbor); and student internships and community outreach programs. Many projects have become an integral part of the regions school science curriculum. For third graders, that means trooping out to storm drains, collecting data about the trash around them and stenciling a large stylized fish and warning sign. This alerts the public that the drains dump directly into the bay. The issue seems surprisingly simple. People understand when humans are at risk from toxic chemicals, but they dont recognize when marine mammals are, said Susan Shaw. And nor do they see the significance of the link between the two. Her institutes groundbreaking research into harbor seals is exposing that connection and changing public policy along the way. 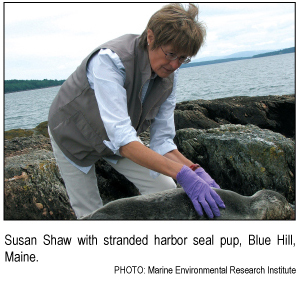 For several years, the Seals as Sentinels project, run out of the Marine Environmental Research Institute Shaw founded in Blue Hill, Maine, has been identifying alarming levels of pollutants in the Gulf of Maines harbor seal populations. Along with PCBs, Shaw discovered rising concentrations of flame retardants in the seals. That was a first. Not only did the flame retardant data attract international attention, it influenced the states decision to ban the most widely used commercial form, DecaBDE. For this work, the state of Maine honored her with a special Citation of Recognition. From small beginnings 17 years ago, Shaws research institute  with marine labs, a field station and an aquarium that mimics the Gulf of Maines ecosystem  has been gaining international recognition for its scientific leadership. And Shaw is the gently-spoken force behind those breakthroughs. Her path to this point has been marked by a desire to understand the world, she said, to find new ways of seeing, whether through photography, public health or marine research. She shares that understanding liberally. In the international arena, she gives papers at conferences, this year in Tokyo and Cape Town. Locally, her institute offers water quality monitoring, educational programs and an environmental lecture series. Fishermen are an independent lot. 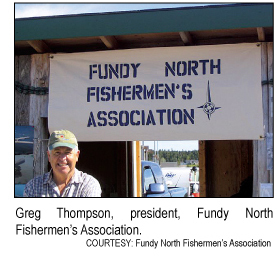 And they pride themselves on it, said Greg Thompson, a lifelong fisherman of New Brunswicks waters. But over recent years aquaculture, liquefied natural gas terminal tugboats and other claims to the open ocean have encroached on that celebrated independence. The shift has not been easy. That accomplishment didnt come without decades of effort and initiative. Years ago, when the government imposed quotas to halt declining ground fish stocks, battles ensued. Each fisherman wanted at least what he or she had before, Thompson said, if not more. 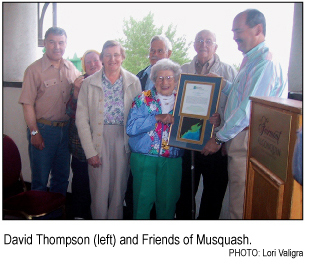 We fought each other over each fish. Out of that head-to-head grew community-based fisheries management, a system Thompson helped develop. It allocates quotas to fishing communities rather than individual fishermen. The main benefit: Communities manage to keep their small fishing enterprises. Thats key, he said, because when a community loses its fishery, its like losing a school or a church  a valuable dimension disappears. Building consensus is a theme for Thompson. Its the only way ahead, as he sees it. So as the demands on the Bay of Fundy grow  from fisheries and aquaculture to tourism and industry  hes working hard alongside others to integrate them in a marine planning process for southern New Brunswick. Estuaries offer a rare meeting of salt water and fresh. In that tidal mix, they support a wide range of wildlife and marine species. Musquash Estuary on the Bay of Fundy is a rarer spot still  an estuary whose ecology and salt marshes have remained largely intact over the decades. A 1990 study identified it as the only estuary in the region not subject to major development: no seaport, aquaculture, industry, dredging or residential buildup. That confluence of conditions led the Conservation Council of New Brunswick and the Fundy North Fishermens Association to propose making the estuary a Marine Protected Area (MPA) in 1998. In March 2007 it became an official MPA. One of the biggest players in nudging the project forward during those years was the Friends of Musquash, a group of local residents, stakeholders and interest groups. Formed in the late 1990s, the Friends facilitated forums and coordinated with government officials over future management of the MPA. David Thompson, the president of Friends, attributed much of the ultimate success of the venture to the perseverance of local residents, people who have lived on the edges of the estuary for generations and wholeheartedly supported the proposal. Now that the MPA is in place, the Friends will become the eyes and ears surrounding the estuary, Thompson said. Members will do field work the government is too understaffed to carry out and offer on-the-ground guidance and advice to Fisheries and Oceans Canada, which oversees the eight-mile (13-kilometer) estuary. Turtles are known to be slow. But in southwest Nova Scotia, the Blandings variety is also a distance walker. 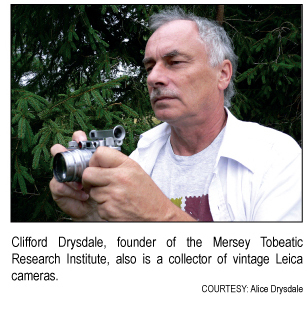 That was one finding of the Mersey Tobeatic Research Institute (MTRI) project to advance habitat connectivity for species at risk. The Blandings turtle recovery team researchers worked in cooperation with staff, trustees and representatives from various levels of government. The results influenced a local logging company to set aside a patch of land to accommodate the turtles wanderings and protect nesting sites. Its one small example of MTRIs collaborative approach to research, said Clifford Drysdale, the institutes chairman and chief executive officer. Forestry is the primary industry in the region, yet theres an open cooperation between landowners, scientists and loggers. That weaving of different interests is part of MTRIs role, which Drysdale described as a combination of catalyst and partner. Established in 2004 by a group of scientists with the support of industry, educators and local residents, the institute has quickly become a hub of new research, data exchange and education programs, all in the service of promoting sustainable use of resources and biodiversity conservation. With 30 years experience as an ecosystem science manager at Kejimkujik National Park and National Historic Site in Nova Scotia, Drysdale, now retired from Parks Canada, is in his element. Still, the publics interest and enthusiasm for the institutes volunteering and monitoring programs have been especially encouraging. It seems to have caught the imagination of the local people, he said modestly. Children meet and talk to the scientists as part of school programs. And research is openly shared with the public as a way to promote conservation. 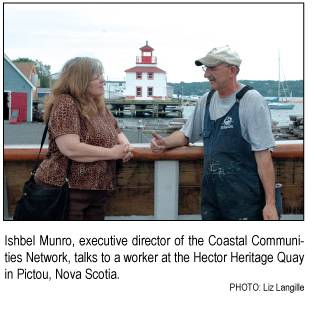 The heart of the Coastal Communities Network, said Executive Director Ishbel Munro, is its ability to provide a meeting ground for a broad range of voices and views. Fishermen rub shoulders with church people, First Nation members share ideas with Acadians, and environmentalists chat with youth groups. Its a network with a big goal: to sustain the social and economic well-being of the small communities that skirt the provinces coast and dot its rural inland. It all started with the cod crisis. In the early 1990s, the ground fishing industry collapsed and with it much of the economic fiber of the region. Munro worked on a committee that organized a series of seminars to discuss the crisis, drawing together all threads of the community. These were people who had rarely stood in the same room, let alone discussed fisheries. It was time to set differences aside, Munro said. It became the unofficial beginning of the Coastal Communities Network (CCN). From there, CCN has grown into an information clearinghouse and generator of creative solutions for local communities. It holds rural policy forums and workshops, and gathers research that communities can draw upon to address their own needs. It also publishes a magazine and maintains a resource-rich Web site. In isolated communities particularly, Munro said, the monthly meetings can be a lifeline and offer much-needed moral support. One of CCNs biggest successes has been its work on wharfs. Theyre how [you] get to work if youre a fishing person, she said, describing them as the linchpin of coastal communities. With 255 wharves in Nova Scotia, the maintenance bill has been overwhelming. CCN jumped in and helped secure federal funding. Then the network did what it excels at: it held workshops to educate people about the role wharves play in the economy and community. Susan Llewelyn Leach is a free-lance writer based in Cambridge, Massachusetts.